Brie Larson proves to be exactly what we need right now: A powerful woman who not only questions the status quo, but is willing to abandon the dominant culture in pursuit of personal liberation. After being relegated to the bottom rung of history for the past two thousand years, women have a lot of catching up to do. It’s a monolithic task, but it sure feels a lot easier when you have a supercharged female superhero carrying the burden on some broad, beautiful shoulders. Gal Gadot pulled us out of the trenches in Wonder Woman with inspirational results, and now, Brie Larson births a whole new feminist era for the Marvel Universe in Captain Marvel. If your first exposure to Captain Marvel was in the 1960s, shortly after DC and Marvel came to an intellectual property agreement regarding the name (DC also had a character named Captain Marvel, now known as Shazam! ), then you probably assume Captain Marvel is a man — or more precisely, an alien male military officer from a species called the Kree. Originally dubbed Mar-Vell by Stan Lee and Gene Colan, this character emerged in 1967 as an alien visitor sent to Earth to spy on us as we develop space technology. Loyal to the Kree cause at first, Mar-Vell gets irritated by his superiors’ disregard for humans and decides to become their intergalactic defender. That’s the canonical take on Captain Marvel in the MCU. Introduced in 2012 with a new story from Kelly Sue DeConnick, Carol Danvers is a contemporary wish fulfillment fantasy, or as DeConnick describes her: “a female Chuck Yeager.” She’s a U.S. Air Force pilot … who just keeps dusting herself off — whether we’re watching her in flashback mode as a little kid falling off her bike, or in futuristic hallucinations zapping green-skinned aliens…. She’s a U.S. Air Force fighter pilot, best friend to Monica Rambeau and gritty survivor who just keeps dusting herself off — whether we’re watching her in flashback mode as a little kid falling off her bike, or in futuristic hallucinations zapping green-skinned aliens called Skrulls. Carol feels like the direct genetic offspring of Ellen Ripley — Sigourney Weaver’s seminal sci-fi heroine from Alien — right down to the opening scene, showing Oscar-winner Brie Larson (Room) wearing the same ribbed, white, undershirt sported by Weaver in Ridley Scott’s original. The tank top is no accident, and it’s highly symbolic — a detail I explore in ‘Reclamation of the Wife Beater’ — because we typically view the garment as the epitome of machismo. 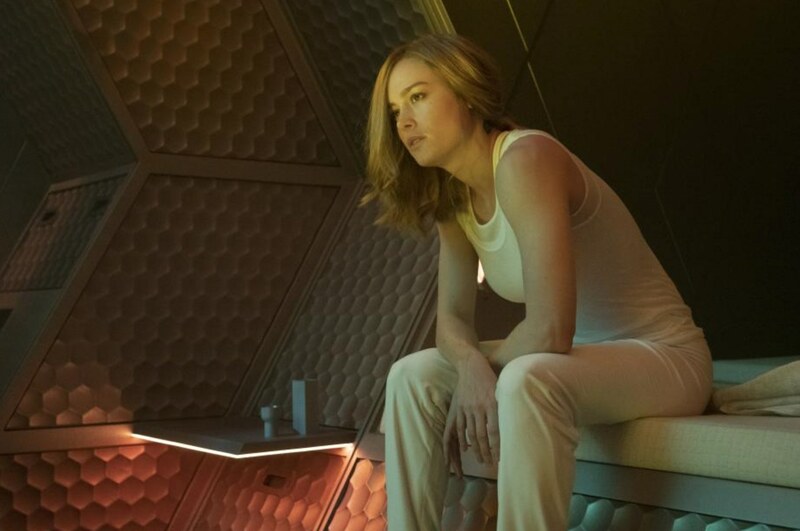 Fruit of the Womb: The iconic white tank top is actually a feminist invention, something directors Anna Fleck and Ryan Boden apparently pay homage to as they outfit Brie Larson in the ribbed white undershit – nodding to Alien’s Ripley and Terminator’s Sarah Connor. Photo courtesy of Walt Disney/Marvel Studios. At this point, we only know her as “Vers”– a blue-blooded Kree warrior who has friendly sparring matches with her gifted commander, Yon-Rogg (Jude Law), but she feels conflicted. She’s burdened by strange dreams of a previous earthling life. She looks Kree, bleeds Kree, but Vers suspects she may well be someone else, and when an accident lands her back on Earth, she’s given the chance to discover her true identity. Carol feels like the direct genetic offspring of Ellen Ripley — Sigourney Weaver’s seminal sci-fi heroine from Alien — right down to the opening scene, showing Oscar-winner Brie Larson (Room) wearing the same ribbed, white, undershirt sported by Weaver in Ridley Scott’s original. Because director-screenwriters Anna Boden and Ryan Fleck (Sugar, Half Nelson) front-load flashbacks into the opening scenes, we can predict the eventual reveal long before it happens — but that kind of goes for everything in this film because it’s actually set before Tony Stark builds the Iron Man suit. Boden and Fleck throw us back to the 1990s in visuals and in song, cranking up nostalgic alt-music hits from Nirvana, Elastica and Hole and crash-landing into a Blockbuster video store. After being stuck on a Kree spaceship for the first 20 minutes, and feeling a little dislocated, this re-introduction to Earth is a huge relief for fans who find the faux astrophysics cloying, and gravitate more to the emotional side of the superhero genre. Back on Earth, we get to see Vers as the prodigal human — the returning voyager who sees the old world with new eyes. Walking around in her Kree flight suit, talking about shape-shifting Skrull and unable to tell people where she’s from, Vers attracts the attention of law enforcement. They assume she’s batty, but when the arresting agent — Nick Fury (Samuel L. Jackson) — discovers a shape-shifting alien in his own squad car, Vers finds an unlikely ally. In essence, this isn’t just the origin story for Captain Marvel’s character, it’s the origin story for Fury and the entire MCU. Only Captain America precedes this timeline, which introduces intergalactic conflict, aliens and time-warping technology as constants. This is where the Avengers story begins, but as Boden and Fleck also understand and integrate into the final, post-credit scene, it’s also where the Avengers story leaves off. This movie had the task of weaving hundreds of story threads together without dropping a stitch from previous franchises, and for the most part, it succeeds — thanks to Brie Larson. Larson has so much screen charisma, you can’t help but fall under her spell from the opening scenes. Embodying the same mix of strength, intelligence and emotional vulnerability as Weaver’s Ripley, Larson’s Carol Danvers is relatable while remaining aloof. We can tell there’s a soft, gooey core deep down, but we respect the fact it’s carefully protected by paranoid reflex. Larson has such a command over our empathy, she redeems the awkwardly written moments of emotional poignancy, as well as the comic-book, time-space mumbo-jumbo that tends to make my eyes glaze over and my ears shut down. Larson effortlessly stretches the distance between dislocated human, and super-endowed alien in every scene. Her presence makes all the green screen feel real because she communicates feelings we recognize — from fear and confusion to physical euphoria. Supported by the acting anvil known as Samuel L. Jackson, the sinister charms of Jude Law, the vast experience of Annette Bening, the unpredictable empathy of Ben Mendelsohn and an orange tabby played by four professional felines, Larson’s performance never falters or flails. 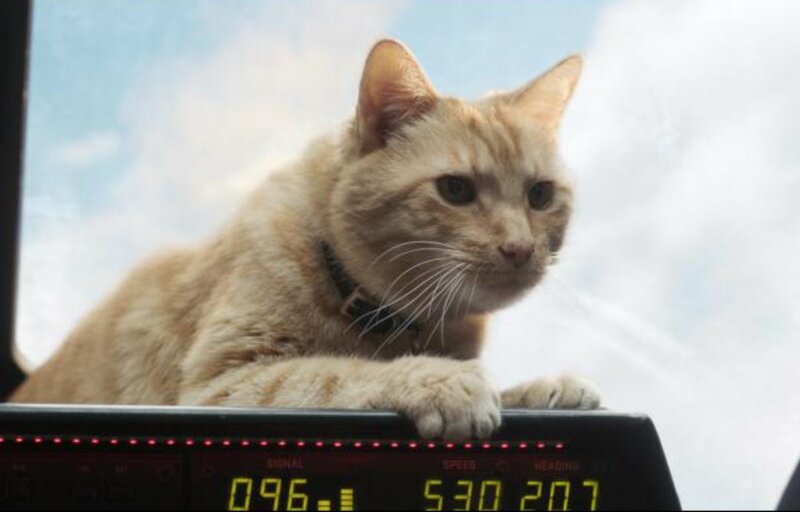 Cats always work in sci-fi, as witnessed by Goose (played by Rizzo, Reggie, Archie and Gonzo). She builds energy in every scene until she, literally, starts to glow. It’s an image that behooves the current zeitgeist as the #metoo moment morphs into a worldwide movement, and women find the courage to speak truth to power. Carol Danvers refused to to along with the status quo. Vers refused to go along with the Kree credo. In short, Captain Marvel is exactly what we need right now: A powerful and familiar character reborn as a woman who is willing to question common assumptions, and perhaps, an entire way of life that casts blame on the powerless, while releasing the powerful of responsibility. Main image: Brie Larson as Captain Marvel, courtesy of Walt Disney Pictures. To read about the history of the “wife beater” and how screen heroines such as Sigourney Weaver and Linda Hamilton have reclaimed its feminist roots, click here. No Replies to "Captain Marvel captures essence of #MeToo moment"